Research-based education was the focus of a one day conference at University College London (UCL)- this week (Thurs 3 April). UCL ranks 4th in the world for research, but according to the Provost, in his introductory presentation, needs to do better in the National Student Survey, i.e. the student satisfaction ratings. The Provost’s strategy for bringing about this improvement is to make UCL a world leader in research-based learning. The conference was principally for UCL staff, i.e. a teaching and learning conference, but there were also some ‘visitors’, attending from other institutions such as the Institute of Education and other Universities. 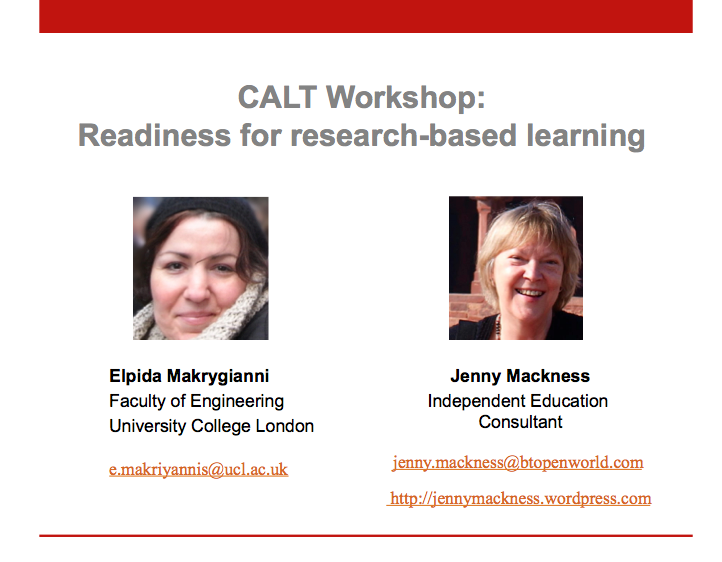 I was attending to run a workshop with my colleague Elpida Makriyannis in which we wanted to promote discussion about readiness for research-based learning in participant specific contexts around such questions as What is research? What is teaching? What is a research community? What is research-based teaching? 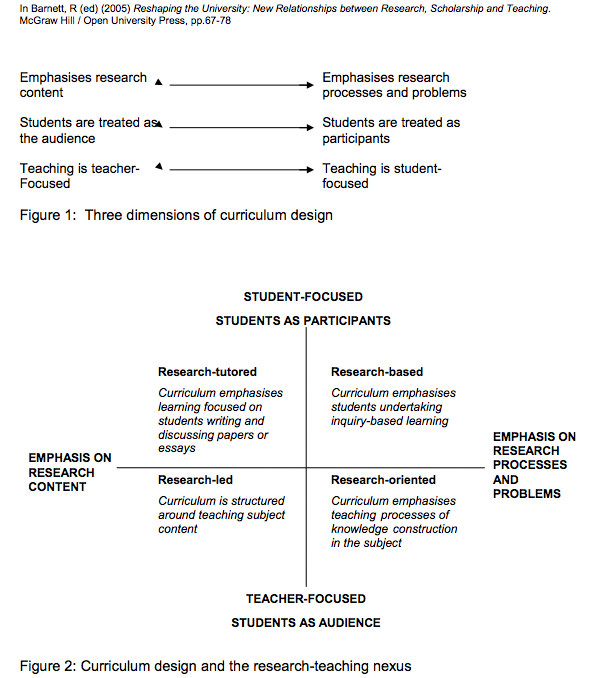 What is research-based learning? Source of Figures: Healey, M. (2005). Linking research and teaching: exploring disciplinary spaces and the role of inquiry-based learning. Despite the excellent practice demonstrated by many at UCL, from the workshop that we ran, it seems that a common understanding of research-based learning is difficult to achieve. Ideas such as negotiated outcomes, student autonomy, collaborative learning and student/staff integrated research communities all need much unpicking and discussion – to make meaning through dialogue and working across boundaries. For an institution that is recognized for its excellence in research, it may be difficult for some to make the cultural shift to the student-centered approach that will be needed to become a global leader in research-based learning. Hasok Chang, who used to work at UCL, but now works at the University of Cambridge, has written that practices which promote the use of graduate slaves, graduate seminars and promoting the budding genius will not turn an undergraduate class into a professional research community. For him learning is not merely practice in preparation for something else that is ‘real’, but requires a community of students and experts in which the research needs to be authentic. So Etienne Wenger was a good choice for the keynote. He talked about research-based education from the perspective of social learning theory. (See tweets here). 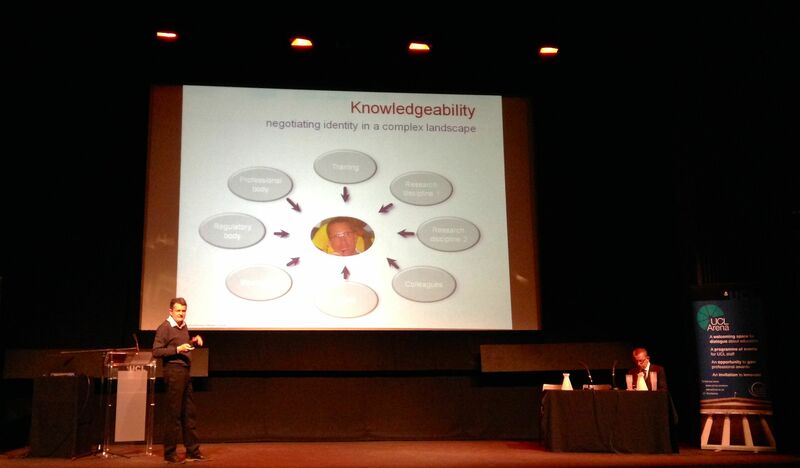 Etienne explained that you cannot separate knowing from the social community in which competence is defined. Learning and meaning-making is part of the becoming of the person. Students need meaningful experiences of engagement with the world. Are our institutions helping students with meaning making, which is where the focus should be, or are they focused on curriculum? Access to information is unproblematic. Access to who you are in the world of a landscape of practices, is the problem. So engaging students in research is a social practice. 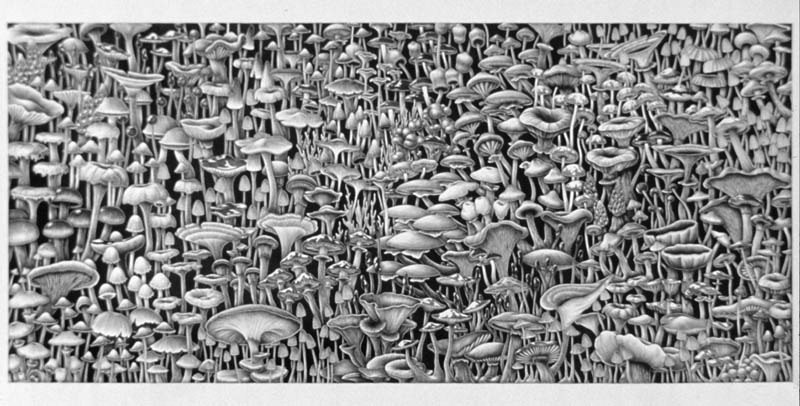 It needs to be social to demystify it, to locate it in a landscape of practice and to apply it to other aspects of life. This has significant implications for the ways in which students and their tutors interact with each – teach each other and learn from each other. These ideas about community, identity, negotiating meaning, student autonomy and so on, are not covered by the Healey matrix. Whilst models such as the Healey matrix certainly clarify the different types of research processes that students can be engaged in, perhaps they are a second step. 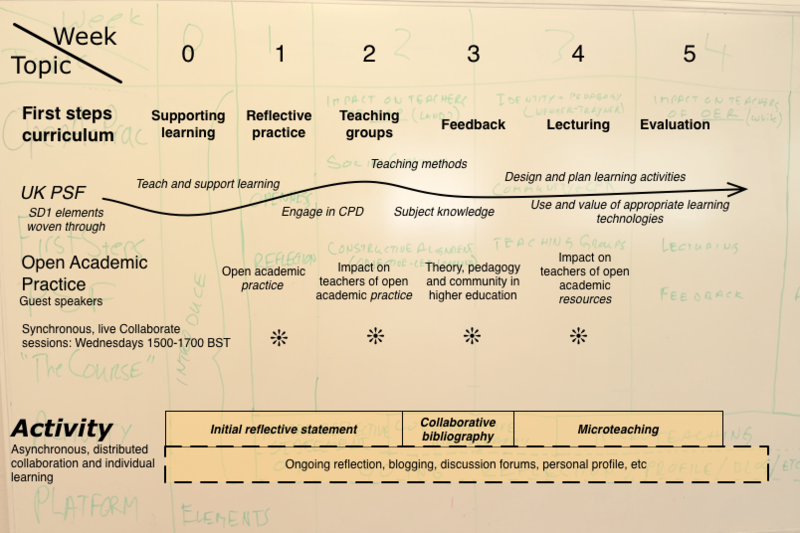 Perhaps the first step is to understand what we mean by student-centred learning, identity development in landscapes of practice and research communities of practice. Chang, H. (2005). Turning an undergraduate class into a professional research community. Teaching in Higher Education, 10(3), pp.387–394. He has grounded the idea of ‘community as curriculum’ in the practice of the community, but he has also stated very clearly what he means by community and what he means by curriculum. There is clear evidence from communities of practice that the practice itself is its own curriculum. The strongest community that I am a member of is CPsquare – the community of practice about communities of practice. This has been going for many years and has a strong group of core members who welcome peripheral participants and support them in their learning trajectory. It is a semi-open community – full access is through paid membership. I am also a now peripheral, but originally a founding, member of the ELESIG community – a community for people interested in researching learners’ experiences of e-learning. This also has a strong core group and is an open community. This community does not yet have the depth of shared history that CPsquare does, but time will tell and it is already developing a substantial shared repertoire. #rhizo14 is a course – a learning community rather than a community of practice? As Sylvia Currie (responsible for the SCoPE community – another community I am connected to) pointed out on my blog (in a comment), and I have also heard Etienne say, it doesn’t really matter what you call it, so long as the basic principles for a community and curriculum are in place. I am, as yet, unconvinced that this can happen in ‘a course’. What I am finding interesting to follow through in my mind, is whether it is possible to have a ‘course’ about something like rhizomatic learning/thinking without contradicting the very premise on which it stands. I have heard Stephen Downes also talk about problems with the word ‘course’ in relation to cMOOCs. For me the most interesting curriculum topic that has arisen in the #rhizo14 ‘community’ (and I still question whether this ‘course’ qualifies as a community – but I think only time will tell) is the topography of the learning environment. In particular I am interested in the notion of ‘ learning spaces’. Keith Hamon wrote a wonderful post on this relating it to a soccer game and field, and it relates very closely to work I have been doing with my colleague Roy Williams about the effect of the relationship between structure and openness in learning environments. So today, I have spent some time reading around this idea of what ‘space’ means to a learner and the constraint that the idea of ‘community’ and ‘course’, if they are not carefully cultivated, might put on a learner in relation to their space for learning. I think Ron Barnett in his book ‘A Will to Learn: Being a Student in an Age of Uncertainty‘ has summed it up for me when he writes about the tension between singularity and universality. This tension is not, I think, problematic in a network. It might be a bit more problematic in a community, but I think it is very likely to be problematic in a course. Whilst this quote obviously applies in a situation where a student is studying for credit or some sort of certificate, I think it also says a lot about the role and power of the ‘teacher’, ‘convener’ of any course – and how that power, knowingly or unknowingly, can constrain the learner’s space. Barnett also writes on p.148 ‘The teacher’s presence may serve perniciously to reduce the students’ space’. This for me explains why community, course and curriculum are an uneasy fit. p.148 ‘Given spaces in which to explore and to develop, students will become differentiated from each other’. ‘Singularity is a necessary outcome of space’. This raises for me the tension between the pressure of community, course and curriculum and the learner’s desire/need to find their own space, their own voice in relation to their own learning. We have had what feels like a bit of a pause over the weekend – many UK participants were maybe taking a break for the Queen’s Diamond Jubilee Celebrations. Its not often we get two Bank Holidays in a row, Monday and Tuesday. But people are beginning to drift back now. Click here to enter the Blackboard Collaborate room. Gibbs, G. & Simpson, C. (2004-05) Conditions Under Which Assessment Supports Students’ Learning. Learning and Teaching in Higher Education, Issue 1. An internet search will result in finding a PDF of the paper and it is well worth reading. I like this blog and The Thesis Whisperer is another great blog for PhD students or those working with PhD students. Do you get Stephen’s OL Weekly (or Daily)? I have for some time. I have often thought how does he keep it up. I hate routine. The thought of having to do the same thing over and over for weeks and weeks or years and years just fills me with horror. But of course we all have to subject to routines in some way. This week I am rebelling. I am not cleaning the house. It looks OK to me – so hopefully it will to everyone else too! Social Networking Condemned to Die. The Problem Is Commitment. This has been in the back of my mind for some time. I do have a Facebook account, but to be honest I can’t really see the point (apologies if I am offending my friends here). If I have a close contact I prefer to email them. And I really can’t imagine that even my friends are interested in the triviality of my life. I have similar feelings about Twitter, although the CCK08 course made me realise that Twitter is useful if you want information in the moment, for example when the Ustream sessions moved to Elluminate and I couldn’t find everyone. If I had been using my Twitter account (which I don’t) I would have known where everyone is. And then there was one of the speakers in the Women of Web 2.0 week who said she was a member of 20 Ning groups. Why? How could you possibly keep up with 20 online communties? Communities involve commitment and reciprocity. I have just been invited to join another online group and I had to join to find out what it was all about. I was invited to join by someone I respect, so I felt obliged to look into it, but I know I will not use it. There are only so many groups that I feel I can belong to at any one time and for me that number has to be small – I don’t want to spend my life online and my attention span is short! The online groups or social networks that work best for me are those based on the principles of communities of practice. I am an online education consultant and work online all the time with groups of learners. I find these experiences, although very time limited, very fulfilling and enriching – a hugely different experience to posting on Facebook. Why do I find this? Well – for the very reason given in the post that Stephen pointed to in his OL weekly – the reason being that in online courses there is commitment – there is a clear domain – we all join round a given subject in which we are all interested – there is a defined area of practice which is associated with the domain and which we all want to share – and because of this need to share and identify with the domain, we are all keen to ensure that the community gels. 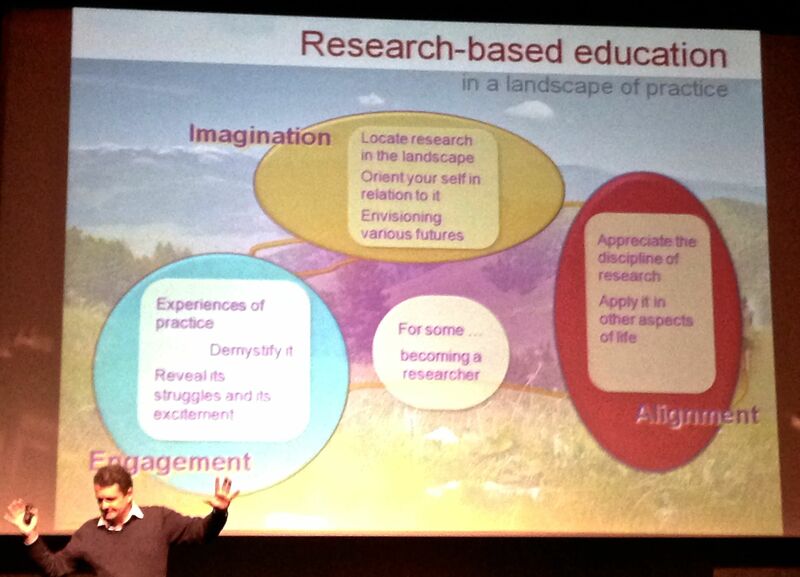 Etienne Wenger has explained all this for us in his work on communities of practice. A community of practice needs the type of commitment that Facebook and other social networks of this type cannot give us. In addition social networks of the Facebook type don’t gather round a clearly identified domain and there is no requirement to share practice. So where does this leave us? How will we move from time-limited commitment and connections made in short online courses, to longer term commitments and connections.? Do we need to? Is it just life that some connections will be transitory? I have made very many passing connections in my online work. But every so often I make a much more lasting one. Currently I am working on a research paper, which explores learner experiences in an online community of practice, with someone who I met on line and who now is a good friend. This has been a very enriching connection. These are the sort of connections that I would like to make online. Connections that involve more than fleeting, passing engagement and where deeper issues can be explored. Well I’ve overcome the feeling that I have nothing to say – at least for this week! Before I finish – just to say that I am still keeping an eye on CCK08 blogs. Have you seen Viplav, Maru and Carlos‘ final presentation. If not, you must. Isn’t this what connectivism is all about. Three people who don’t know each other, from right across the world working together to produce this presentation – gelling their ideas, accepting each other’s differences, communicating to produce a high quality presentation! And there was one that I found earlier in the week and such are my technical skills that I can no longer find it, but it was a Flash presentation showing how weak and strong ties in the network grew and faded as the course progressed. I am really peeved that I can’t now find this presentation as I would have like to keep a record of it. Thanks to those who have encouraged me to keep blogging.